So once upon a time there was this guy named Brent. He was by all accounts an exceptional brother, son and friend. He was one of 20 founding member of the organization that is now leading the way of the fastest growing sport in the country. 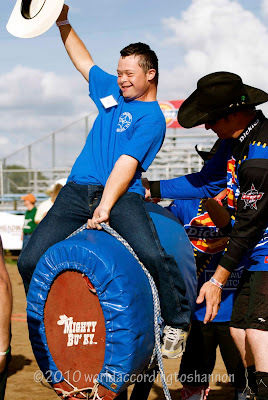 He was an amazingly gifted bull rider. 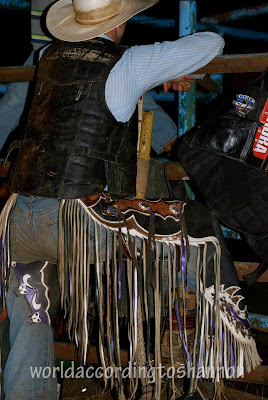 Many of the current generation of bull riders consider him a hero. Brent's mother said "In my life I have never loved anything, with the exception of my children, the way that Brent loved bull riding." I never had the chance to meet Brent, although I suspect we may have crossed paths, but this weekend I had the distinct honor of participating in a long sweaty weekend full of smiles and memories honoring him and his dreams. 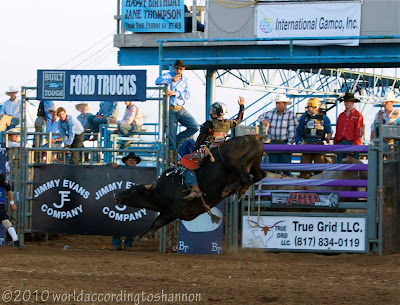 In Bastrop, Texas somewhere in the neighborhood of 3,000 people converged to watch a professional bull riding competition. 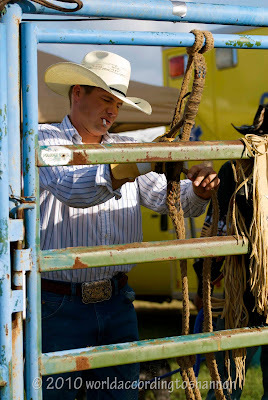 There was talk of buckle bunnies and cougars stalking the cowboys behind the chutes. A lot of beer was consumed, and a fair amount of whiskey depending on who you were hanging out with. 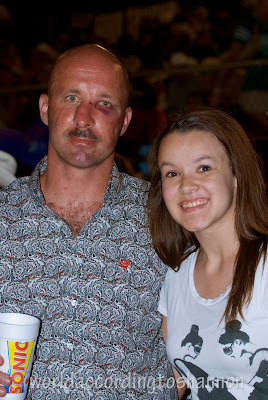 A young junior bull rider's Dad beamed with pride for his son's first buckle win at the same time he confessed his fears for his son's health. 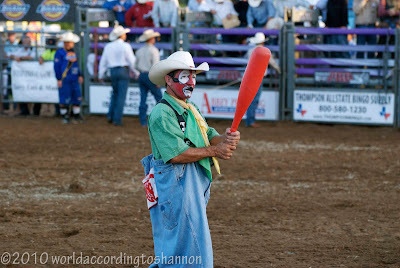 A bull fighter stepped in for the save after one of the junior bull riders was bucked. He paid the price, but was glad to have done it. and the home crowd got to see Ben Jones' happy dance in person. But all of this was the second act. What was amazing was what happened before. 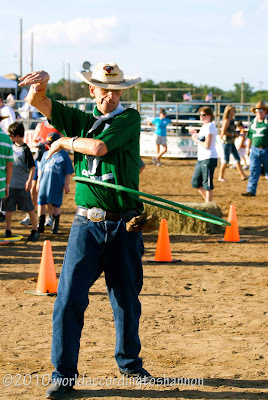 It is a living, breathing, riding, roping and smiling legacy to a man who had spent his time with special needs children and who had planned to endow proceeds from a bullriding to the organizations that help them with their living needs. 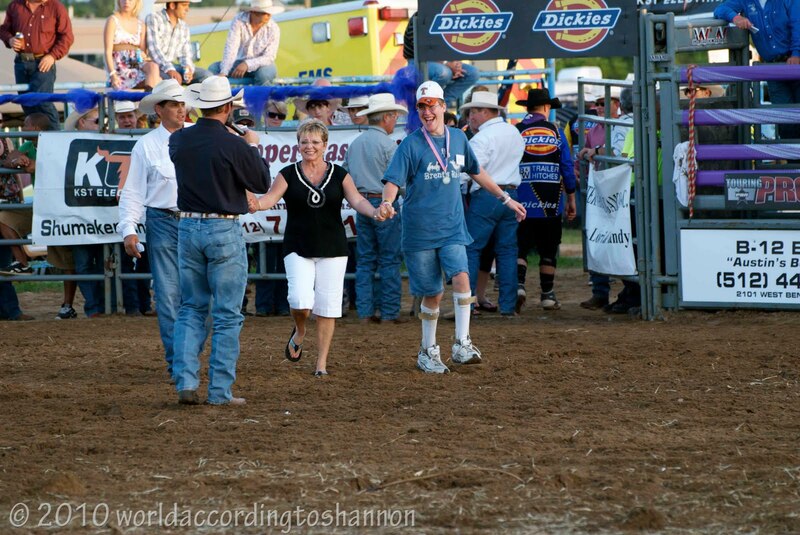 They are Brent's Kids and they come each year for their very own Exceptional Rodeo. 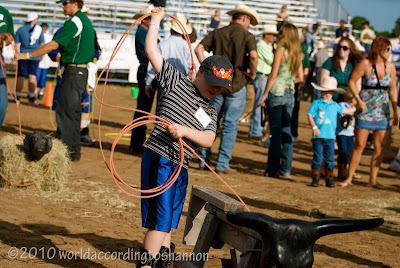 The stock contractors, Brent's friends & family, cowboys, bullfighters and their families all turn out to lend a hand and share the life they love and learn as much as they teach. Many of these Exceptional Cowboys & Cowgirls have been coming for years. Miss Kay, as they call her, calls them by name, encourages them and lets them make announcements over the PA system. 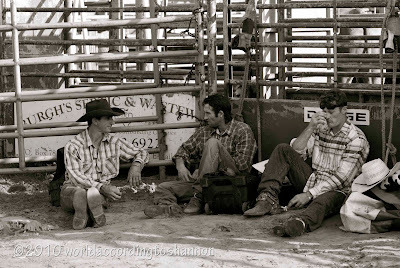 And because they are good athletes when their event is over they stick around for the second act and watch the other bullriders do their thing. As the night wore on I watched as a rider in his prime celebrate having made the buzzer, come through the gate with a swagger making his way through the crowd when he stopped, doubled back and shook the hand of one of Brent's Kids who was waiting there cheering & celebrating every successful 8 second ride. I found that I was the odd man out. Everyone I met asked me "How did you know Brent?" I learned pretty quickly that I was one of the only volunteers who hadn't known him in life. It speaks to the quality of that life when 16 years later your high school classmates, second cousins and old neighbors are still showing up to raise money in support others in your name. 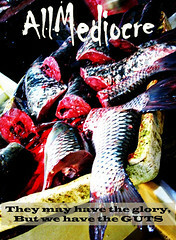 the world should be and I am better for brushing up against it. I can't wait for next year, sign me up! I just came across this blog. Just like your photos, it brought tears to my eyes. I was blessed to have known Brent most of his life. You came to volunteer at an event you thought you might want to find out more about. You left with a deep appreciation for all the event means to us that loved Brent dearly and for what it means to our special athletes. That in itself makes all the hard work that is put into the event worth it if you truly got a sense of who Brent was and what we do this for. We can't wait to have you back next year and look forward to getting to know you better. Thank you again!!! 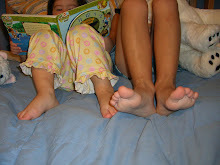 I just read your blog and like Denise it brought tears to my eyes. Brent was such an awesome guy and was very much loved by everyone. He never met a stranger. Denise and Shannon and the rest of the BTMB Foundation Thanks for all you do for Brent's kid's. Thanks so much for putting this together, Shannon. You're extremely talented. Thanks too for your help this year and for volunteering your time and sweat. We're blessed to have you aboard our team in this endeavor and labor of love. God bless. The pictures and your words are simply amazing! Thank you for your time and most of all for sharing your talent with all of us that knew and loved Brent! 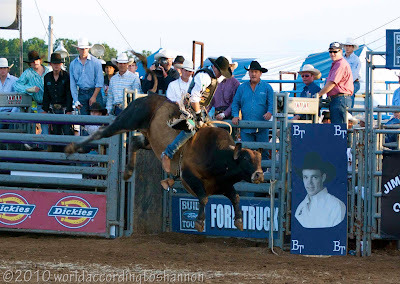 I am still trying to absord the kindness and reality of your words written regarding the Brent Thurman Memorial PBR. You are living proof that we in some minute way achieve these two very important things when attending Brent's Special Day: 1. That even if you never knew Brent, you leave the event feeling that you know something about him and what he stood for and 2. That if you watch, attend or volunteer for the Exceptional Rodeo you then understand why we all contribute our time, money, sweat and tears. Our dedication comes from our love of Brent because if he was your friend, you were his family. Obviously, we had a very large extended family because of his extended travels. Our committee is made up of family and friends that unite annually to pay tribute to his life and now his memory. We certainly do not reap any grand monetary rewards and each year I rant and rave about the lack of funds and this year I gave up and turned it over to God (which is what Brent would have advised me to do years ago). As you can see God and Brent prevailed another year. I am so very humbled by your kind words and I can tell by your description of his event that you got "it", whatever "it" is. Brent had "it" and obviouly your have "it" as well. I am thankful for your gift of words and your first year of committment to Brent's cause. It is not for the faint of heart due to the heat but we thank you for your service and hope to see you again next year. May God Bless our newest old friend! This tribute to this year's perfoemnce is very nicely done. 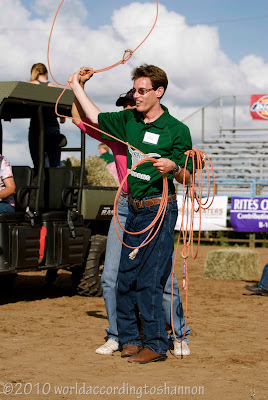 This was our first year at the event. Julie, the kids and I had a ball. It is special when you see so many people come together and do some things that really matters. Todd and Jeanne Thompson had encouraged us to come out to see what the day is all about. Though we carried a short article in the Hill Country Sun to help promote, it did not do justice to what this event is all about. Congratulations to all of you involved to do something that makes a difference. That was very kind words. That brought tears to my eyes. This was my first year and I could feel the love everyone felt for Brent just being there and I will be back again and again. That is the most wonderful bunch of people I have ever meet. Just like you I did not get to know Brent. But I fell blessed to get to have great friends like Andy and Rhonda Carey that have filled me will great stories. 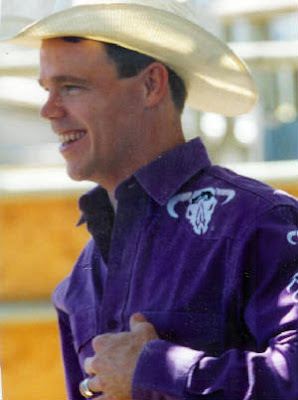 My husband was the bullfighter that was hurt helping the young man and he also fells a great passion just like Brent did for the sport. God Bless.